When did being “too busy” and “going through the motions” become a way of life? It’s no surprise that the rush between meetings and e-mails, sports practices and church functions is tiring, even exhausting. It’s time to stop running and start following. Jesus’s call to “Follow Me” was not just an invitation to faith; it was a prescription for living well. 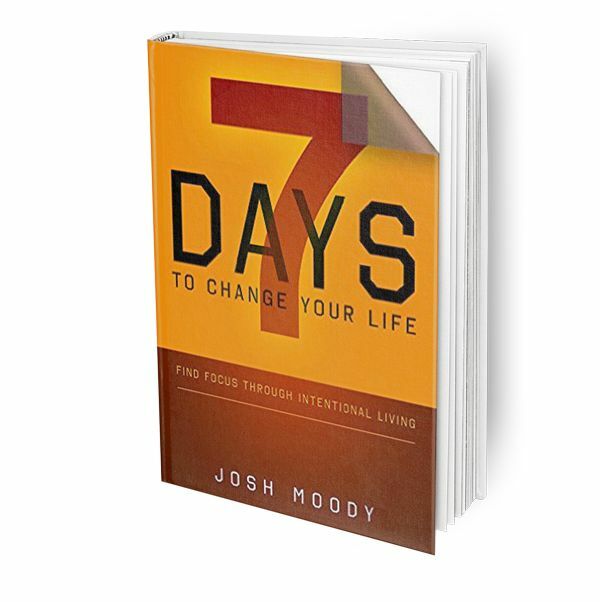 Walking through the seven “Follow Me” statements in the Gospel of Matthew, author Josh Moody explores Jesus’s teachings of hope, life, truth, freedom, humility, greatness, and glory in 7 Days to Change Your Life. In each statement and with each teaching, Jesus gets closer to Calvary and closer to the cross, and you get closer to finding a focus for your life–no matter how hectic it may be. Although following Jesus is not a new concept to believers, following Jesus completely becomes difficult when life moves faster and faster. Organized to be read a chapter a day, Josh meets you in your busy, hectic schedule and reveals a biblical plan to revitalize your life in as little as seven days.